It goes without saying that having a baby is a life changing event. Thankfully, there is a wealth of information about how best to raise this new tiny human and get through the early days in one – albeit sleep deprived – piece. However, there is relatively little information on how to prepare four-legged family members for the new arrival. While there is anecdotal evidence that dogs may know before their owners that a baby is on the way, this doesn't mean they have any concept of what is to come. To help prepare them for this big change, parents-to-be need to consider what their new domestic life will look like – from a pet's point of view. The top priority is safety. Pets and children can grow up to have amazing relationships, but this ideal should not be assumed or taken for granted. Given that you should never leave dogs and young children alone together, it is wise to get your pets well accustomed to a new level of separation. It isn't fair to come home from hospital one day with a new baby and suddenly shut your dog away in the kitchen. That's not to say you can't shut your dog out of a room – indeed it can be the safer option. But they need to be taught in advance that being separated from you is totally fine and an opportunity to relax. Stair gates are a good way to create a physical barrier between rooms without shutting the dog out completely. If your dog tends to pull on a lead, it is worth training them in advance to walk politely on a loose lead alongside a buggy. This way, after the baby is born, they already know what is expected of them and are happy to trot alongside. The risk of them pulling you and the buggy over is greatly reduced – and the walk becomes an altogether more pleasant experience. Getting them used to you carrying a baby is also important. Start by carrying – and talking to – a small bundle of blankets. Bare in mind that we tend to talk to our pets in the the same way we talk to babies, so it would be reasonable for our pets to assume we are talking to them. Your dog might jump up to have a look at what you're talking to and it is this which could be dangerous when you've actually got a newborn baby in your arms. Therefore we need to teach them not to jump up, and that good things happen when they don't (such as a tasty treat being tossed to the floor). Like humans, dogs and cats need their own space – somewhere they can retreat to for some peace and quiet. Cats often like to be up high, so create ways for them to reach the top of a wardrobe or bookshelf, and provide some comfy bedding there, too. For dogs, a covered crate in a quiet area of the house works well, but ensure it is easily accessible and large enough to stretch out in. By adding these spaces early on, pets will learn that if they need an undisturbed, safe space, it is available. Babies can make a lot of noise – with some cries reaching up to 120 decibels. For animals new to these sounds (and with an acute sense of hearing) this can be stressful. Teaching them it's a noise they can ignore is very beneficial. Recorded clips of babies are easily found on the internet – and unlike with a real baby, you can adjust the volume. To begin with, play the sound quietly when your pets are relaxed. Ideally, the pet will notice the sound, but then ignore it. If they do get up to investigate, you can drop some treats on the floor and leave the sound running quietly. You could also have some treats ready and start feeding them when you play the clip, so they learn that the sound is an indicator of good things happening. If your pet is worried about the sound, even on the quietest volume, it would be worth consulting a qualified behaviourist. Trying to keep your pets' routine as predictable as possible in the early days can help reduce their stress levels. During the very early days, walking the dog might seem like an epic task, so it might be worth enlisting friends and family – or a local dog walker – to help. With a little bit of effort, you can help prepare your pets for the arrival of a new family member. It will still be a time of adjustment, though, so be alert. 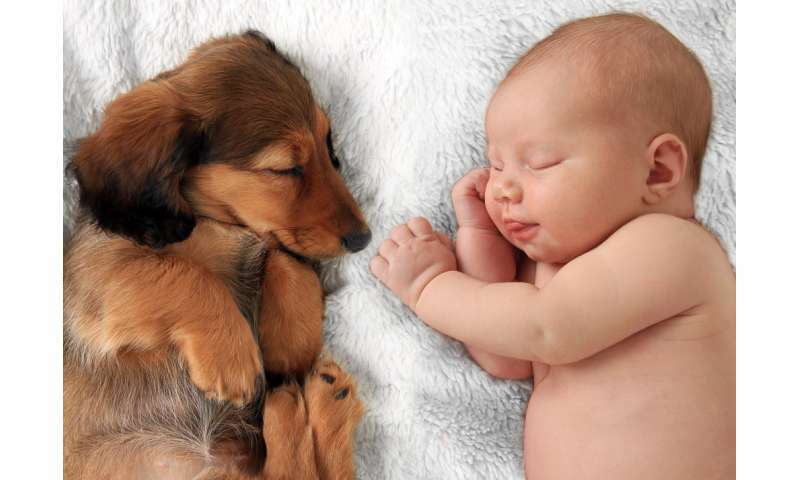 Never punish your dog for coming near the baby – instead, encourage calm, polite interactions (where safe) while teaching them alternative behaviours, such as settling on their bed. If you are worried at all about your pet's behaviour, don't leave it to chance. Seek advice from a qualified animal behaviourist who can advise on the best way to make bringing home a new baby as stress-free as possible for your pets. Want a pet but can't have a dog?